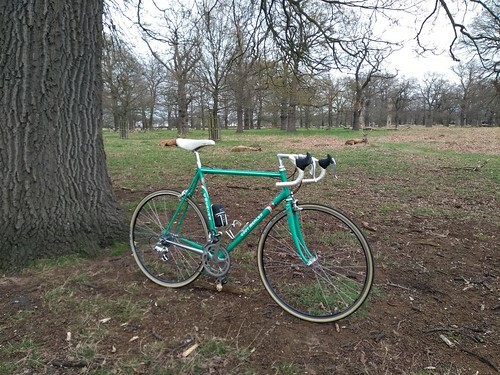 I have a resprayed frame arriving soon (colour: Bob Jackson Blue Odd 3), with chrome lugs, forks and rear end. The decals are grey, as are the cables. It's a late 90s job, and I have brand new Turbo saddles in black and white. Components are late 90's / early 00's. Normally, I would go white saddle and white bar tape, but the (Shimano) hoods are black, and I don't know if it will look awful. Anyone have opinion/thought/experience of white tape and vintage black hoods? I think it will look great. one of my old bikes in a metallic blue with white and white. Thanks to all - both of those bikes look great. The white saddle it is. Now to find some suitable white tape! White, white & white........ but they are a bugger to clean!